In the bathroom there is a shower, a. 2 Toilet and a washstand. The bathroom has a window and can therefore be well ventilated. A hair dryer, shower gel, shampoo and body lotion and liquid soap are provided. We shared this apartment with my brothers family for a family wedding. Christiane was very accommodating and even provided an extra bed for us. The apartment is closed to Dammtor public transport, is in a quiet and safe neighborhood and a grocery store is in walking distance. There are restaurants nearby and it was great to have the outdoor space. This was a great place to stay in and I would highly recommend the apartment and the owner. It was unfortunate that there was construction across the street which lead to some noisy awakenings during the week, but luckily they took a break during the weekend. We had a lovely stay for our first trip to Germany!! The apartment is perfect and great access to train station and walking distance to lake front. We were there for Ironman Hamburg and the city didn’t disappoint. Absolutely lovely! 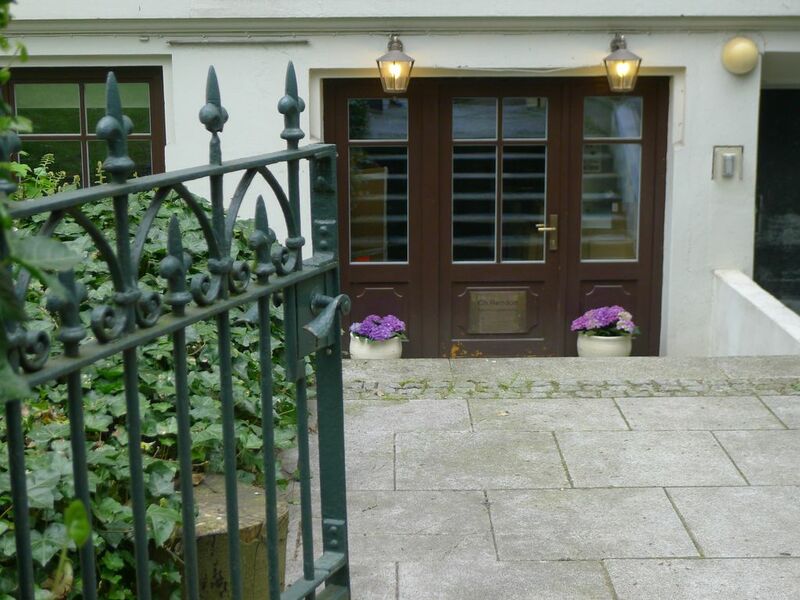 My colleague and I stayed here on a recent business trip to Hamburg University and had a lovely stay here. It is perfectly situated for the university, as well as being in a great location for exploring the rest of Hamburg, which we were fortunate to have time to do. There are plenty of shops and restaurants within easy walking distance. Dammtor station, with transport links to the rest of the city is only 5 minutes walk away. Also within a 15 minute walk are the beautiful 'Planten un Blomen' park and the Inner Alster, both lovely for a walk. The Elbphilharmonie and 'Dialog im Dunkeln' were a longer walk, but still easily and pleasantly walkable (or a quick U-bahn ride direct from Dammtor). Both were highly enjoyable experiences not to be missed! The apartment itself has everything we needed, with plenty of space for us. Although there were only two of us, there is more than enough space for more people. The bedrooms were quiet and the beds were comfortable, and the outside patio was a lovely place to sit and enjoy the warm spring weather. There are lots of interesting garden sculptures to look at too. Christiane was very helpful before we arrived and offered her help any time while we were there (not that we needed it). A bottle of wine was a lovely welcoming touch to the apartment, and we enjoyed exploring the lovely pieces of art and design in the apartment. We would thoroughly recommend both the apartment and Hamburg itself as a destination. My family and I recently stayed for 2 nights in this lovely apartment. We were 4 adults and 3 small children but the apartment still felt spacious and comfortable. The apartment was very clean, had everything we needed for a short (or longer) stay, the towels were soft, the beds were comfortable, the coffee machine worked, etc. In addition, the apartment is decorated beautifully with art and photographs that make it unique and interesting (although nice things and toddlers don't mix well so I had to be extra careful in watching my littlest one). It is located on the ground floor of an old building and in an area full of gorgeous old homes and buildings. It was nice to simply wander around the neighborhood, especially with spring flowers starting to bloom. The location was very good for us as there are restaurants and stores within a short walking distance of the apartment. The train station is also a short walk away and beyond that, it is not far to the Rathaus and other parts of the city. The lakes are also nearby and that is a great area for runners. There is even a hop-on, hop-off bus stop just a few meters from the apartment. The owner, Christiane, was always responsive, helpful, and friendly - from answering my emails to meeting us early in the morning for check-out. In sum, I would highly recommend this apartment! The bed was very comfortable and there are many windows available for daylight, along with good shades for privacy at night. The apartment is situated below grade, but is certainly large for two to four guests and does not feel cramped or dark. Christiane was gracious, inviting and easy to communicate with. The neighborhood is pretty with a nearby park, large trees, and easy walk to shop and dine. We would definitely stay here again. The location is perfect: right on the Park (Moorweide), 5 minutes walk to Dammtor train station, where you will find S-Bahn trains and buses in all directions. On foot it is 20 minutes to Jungfernstieg, 3 Minutes to the Aussenalster with BODOS boat Steeg or the CLIFF. A supermarket is 10 minutes' walk. The opera as well. A CINEMAXX cinema also. We are here, although "in the middle", but totally quiet and green.